Prosthetic limbs and assistive technology (AT) require customization and modification over time to effectively meet the needs of end users. Yet, this process is typically costly and, as a result, abandonment rates are very high. Rapid prototyping technologies such as 3D printing have begun to alleviate this issue by making it possible to inexpensively, and iteratively create general AT designs and prosthetics. However for effective use, technology must be applied using design methods that support physical rapid prototyping and can accommodate the unique needs of a specific user. While most research has focused on the tools for creating fitted assistive devices, we focus on the requirements of a design process that engages the user and designer in the rapid iterative prototyping of prosthetic devices. The length of his arm, significantly impacted Kevin’s ability to play the cello. During the prototyping process he was able to test a variety of lengths by adding on layers of Lego to his prototyping prosthetic. 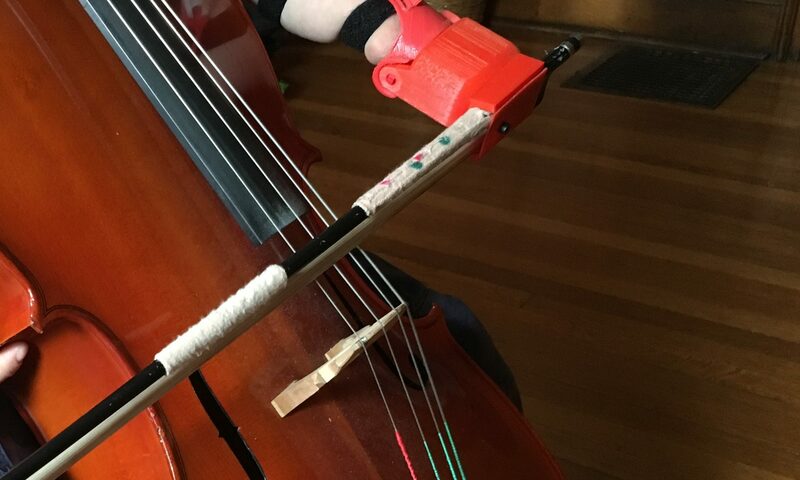 Kevin enjoys his latest cello bow holder so much that, according to his mother, she’s not allowed to touch or adjust it in case it gets messed up. “Life changing technology can come in many forms; it can come in the form of Styrofoam and pipe cleaners,” Said one participant while working on adjusting the angle of her prosthetic to maximize her comfort while gripping a hand-cycle. Brett M. Fadgen MSN, CRNA. is a practicing Nurse Anesthetist with an amputation below his left elbow. He has customized his profesional grade prosthetics to help him perform nursing tasks. Despite having a wide variety of professionaly designed prosthetic devices, Bret never found a good solution for using a common table knife. Using 3D scanning technology and modeling clay we were able to design a custom grip that could stabilize the knife in his myoelectric hand. Megan Kelly Hofmann, Jeffery Harris, Scott E Hudson, Jennifer Mankoff. 2016.Helping Hands: Requirements for a Prototyping Methodology for Upper-limb Prosthetics Users. InProceedings of the 34th Annual ACM Conference on Human Factors in Computing Systems (CHI ’16). ACM, New York, NY, USA, 525-534.